I like to use skincare products that contain natural and organic ingredients. I take the time to make sure I eat healthy natural foods so why not only put natural products on my skin too. I want to take care of my skin like I do my body. I love using natural oils on my skin to make it healthy and beautiful looking. 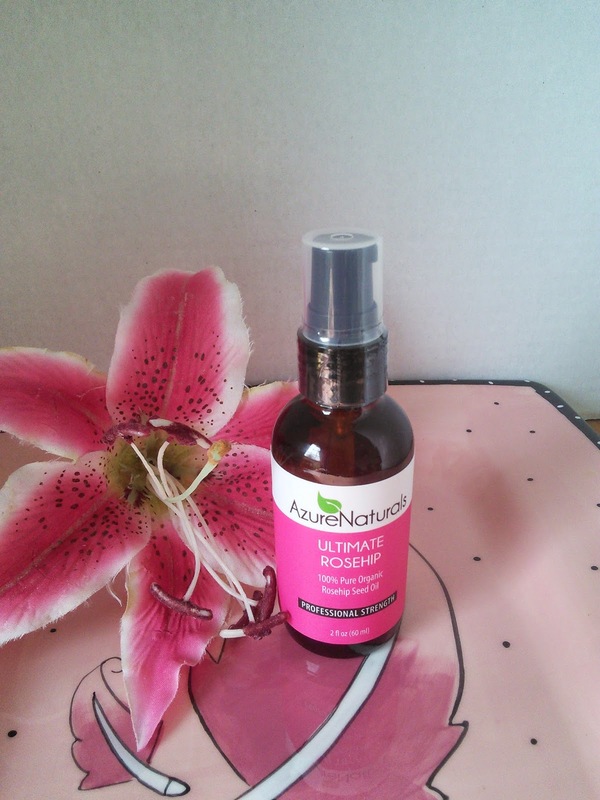 I was sent a bottle of Ultimate Rosehip Oil from AzureNaturals and I was surprised at all the ways I can use it. This oil is a pressed seed oil, extracted from the seeds of a wild rose bush. This wonderful smelling oil is great to use on skin, face, hair, and even nails. The oil is also great to use on stretch marks and burns. I love that I can use one product in so many ways. I also love that it is 100% Pure - Paraben-free, oil-free, dye free, fragrance free and filler free. Rosehip oil is a lightweight, non-greasy and quickly absorbed natural oil that contains essential fatty acids plus super antioxidants along with vitamin E, C, and A(Retinol) that helps delay and reverse the signs of aging. This oil will help with new cell regeneration and promote collagen and elastin production. All this will leave your skin firmer, smoother, and more radiant. I found the Rosehip oil so easy to use. The wonderful scent made me feel like I was at a spa as I applied it to my face and hands before bed. It absorbed quickly and made my skin feel so soft. A little bit goes a long way so I can see this bottle lasting a long time. AzureNaturals want you to be happy with their oil and offers a one year money back guarantee that even includes shipping. 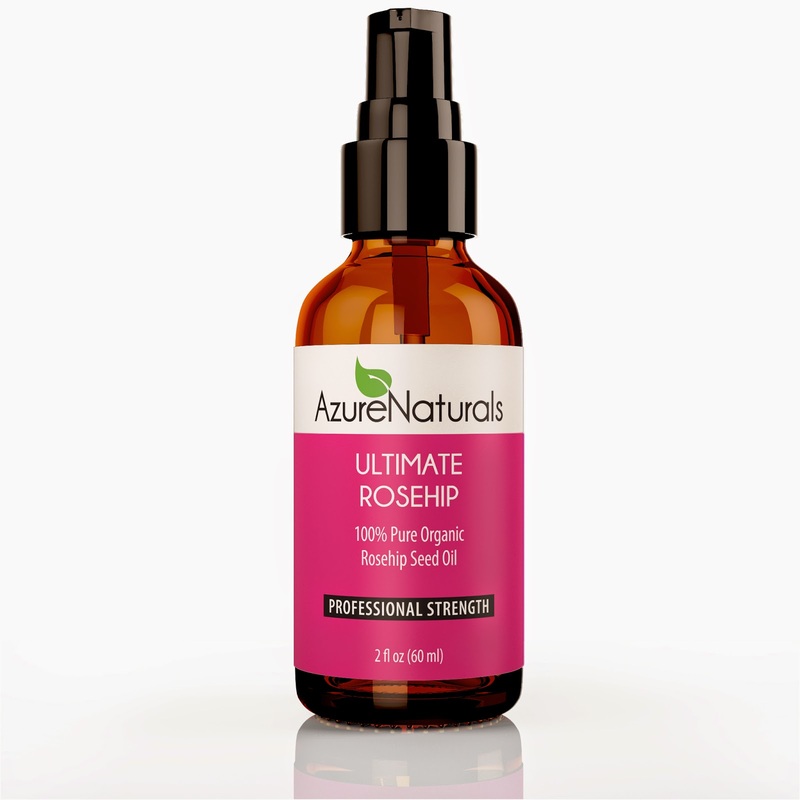 For more information on AzureNaturals Ultimate Rosehip Oil, click on the below links. Everything about that sounds wonderful but does it smell like roses? I really don't like the smell of roses. I like that it absorbs quickly! Hate oily feely! I've heard a lot of people say this worked great for them. I'm not able to use it due to medicine I'm on. :( Great post! this sounds wonderful. I enjoy the smell of rose petals and anything to help dry skin is a good thing. I'm glad that you found a rosehip oil that smells good. Some of them actually don't! I LOVE rosehip oil! I use it daily for my skin condition! It WORKS! Nice! I am actually trying this myself!! I can't wait!! I've heard great things about rose hip oil - I'll have to check this out! My Grandmother used to swear by rose hip oil. She was ahead of her time in using all natural oils in her beauty routine. I'll have to check out this brand the next time I'm on Amazon. Thanks. I've never heard of this kind of oil before, but I sure would love to see how well it works on scars! Definitely going on my Amazon wishlist! I agree that it is so important to use natural products on our skin but they can be hard to find. This sounds terrific! I'd love to see how this works on scars, and the pleasant scent is a bonus. Rosehip Oil sounds awesome! I did not realize all of the awesome ways it could be used! :) Very cool!